This inscription is on the Port Meadow bridge (part of the Thames Path) that leads in the direction of Medley Manor. Note that the letter C is missing in the word “SUBSCRIPTION”. 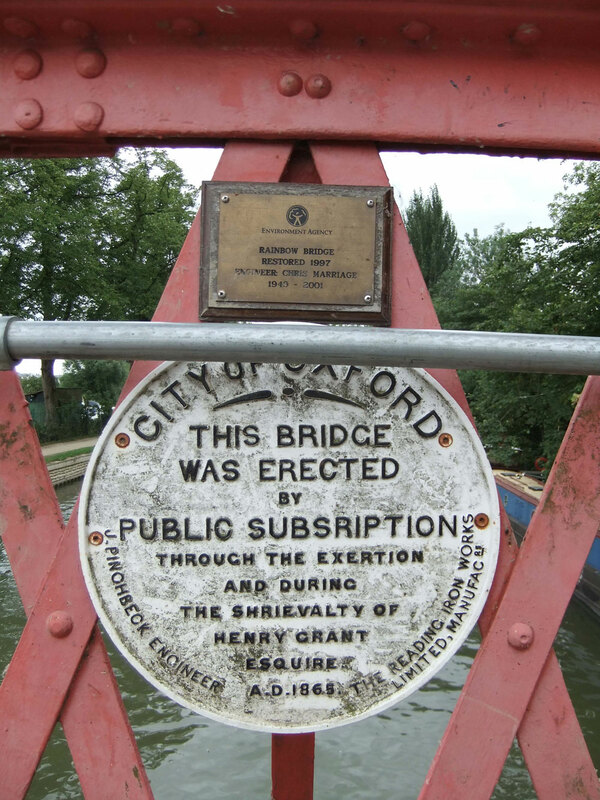 Henry Grant, the Sheriff of Oxford for 1864/5 who organized the public subscription for this bridge erected in 1865, was the butler of Christ Church. He was born in Ovington, Hampshire in c.1822, and at the time of the 1861 census he was living at 88 St Aldate's Street with his wife Ann, his four daughters, and one servant. In 1871 Grant described himself as a bailiff as well as a butler, and the family had two servants. NEW BRIDGE AT MEDLEY.–A wrought-iron lattice girder bridge for foot passengers has been placed across the river at Medley, for the convenience of persons crossing from the strip of land running from the centre of the stream to the Botley Turnpike, and also for those in Port Meadow. It spans the whole of the navigable portion of the river, above the lock. It consists of one large and very fine span, 69 feet in length, and 5 feet in width. It rises in the centre to a height of nearly 10 feet above the low water line, so as to enable house boats to pass beneath. The navigation on that part of the river is now confined to pleasure boats. The structure, which is light and elegant, but at the same time sufficiently substantial, was designed by Mr. James Castle, Engineer of the Upper Thames, and has been carried out by Mr. John Pinchbeck, of the Reading Iron Works Company. The bridge stands exactly over the old Medley fordway, and the landing place on the towing path was given by the Dean and Chapter of Christ Church, who have generously undertaken to make good the towing path up to the feet of the bridge. The use of the latter cannot fail to be appreciated by visitors to Binsey and Godstow, and the public certainly owe a debt of gratitude to Mr. Henry Grant, the late Sheriff, who was the originator of this valuable improvement. Soon after crossing the wooden bridge I came to the rainbow bridge, looking, like all other machine-made products, solid and useful. But I must say that I prefer to look at the uneven and twisted old wooden structure because it seems a part of its surroundings. The effect of the perfectly-planned metal bridge is that of forceful strength controlling Nature. Had the hills and soft green meadows been replace by powerful rocks or high mountains, the contrast would not have been so forcible; but here, among the trees and gentle countryside, a simple wooden bridge seems to be admirable.